The Library Steps is a new pairing of an old rapper named Jesse Dangerously and a young producer named Ambition. 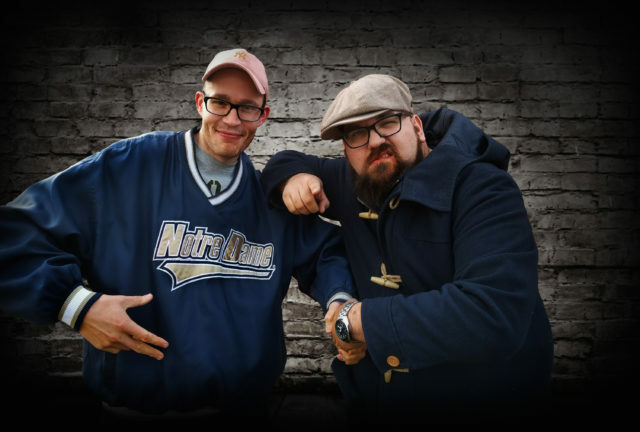 The duo is named in remembrance of the now demolished stone stairs of the Halifax Memorial Library entrance, where among a loose and ragtag assortment of the city’s rappers they would gather across generations every Friday as the doors locked, to freestyle, beatbox, and play tapes in a cipher called Public Rhyme Distribution. Jesse and Ambition have been members of the Canada-wide collective Backburner since 2001 and 2009 respectively, but only started making songs as a rapper/producer duo in the spring of 2017, when Hand’Solo Records offered to release an album. Like a gear that grinds and strains before suddenly locking into place and sending its mechanism lurching into motion, it took them more than a decade of intention to pair off as a team. All of the beats and rhymes for Rap Dad, Real Dad were created in the next few months as a time capsule of that season’s preoccupations. The result is beats that are jazzy, soulful, and moody, with a prominent nod factor, and rhymes that are confessional and witty, vulnerable and boastful, intimate and intimidating. Under their fingernails, no microscope is needed to detect the DNA of golden era rapper/producer teams like Pete Rock & CL Smooth, Gang Starr, a gentler Beatnuts, or any group that was part of Native Tongues or Hieroglyphics. Just as present are the influences of turn-of-the-century underground boundary pushers like Sage Francis, Aesop Rock, MF Doom, and Buck 65, and for that matter, just about everyone who was on Roc-A-Fella at its peak. Refracted here, those chosen ancestors and more recombinate into a hip-hop that challenges, from unexpected angles, traditional modes and narratives of masculinity. They are your rap dads, and they just may be your real dads, too.